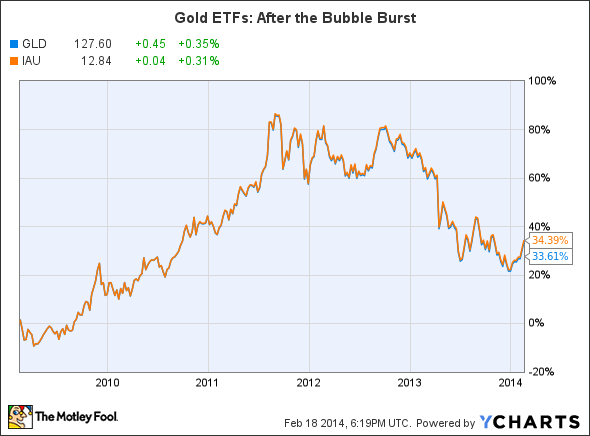 The price of gold has plummeted over the past two years. Who's felt this impact the hardest? Here are the world's 10 largest holders of the precious metal. "The desire of gold is not for gold. It is for the means of freedom and benefit." Gold is one of the most peculiar elements ever discovered, with a value that far exceeds its practical usefulness. People wear it. Central banks hoard it. And speculators trade it back and forth in anticipation of future economic and political events. In just the past year, consumer demand for gold jewelry soared to the highest level since the financial crisis. At the same time, however, speculators unloaded a staggering 880 tons of the precious metal. The net result sent the price of gold down by a staggering 30% since September 2012, extracting an analogous toll on the largest gold-based exchange-traded funds, the SPDR Gold Shares (NYSEMKT:GLD) and the iShares Gold Trust (NYSEMKT:IAU). Who was hurt the most by this? If data from the World Gold Council is any indication, the organizations that took the biggest hit were all government bodies. What follows, in turn, is a table of the 10 biggest holders of gold as of December 2013.